BJP president and former Chief Minister B.S. Yeddyurappa appears to have placated the Katti brothers who were upset on being denied ticket to contest the Lok Sabha polls from Chikkodi. The brothers had expressed displeasure with the party’s decision and had set a deadline of April 4 for deciding on their future political moves. Speculation was rife that Ramesh Katti, former MP, would quit the BJP and fight as Congress nominee from the segment. 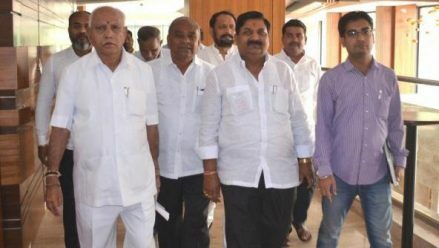 However, after a two-hour meeting with the leaders, Mr. Yeddyurappa said there were no differences between party leaders in the district and they would all work for the victory of the nominees in Belagavi and Chikkodi. MP and Belagavi candidate Suresh Angadi, Chikkodi candidate Anna Saheb Jolle, and Nippani MLA Shashikala Jolle were present. “The Katti brothers will be present when Mr. Jolle files his nomination,” the BJP State chief said. However, Mr. Ramesh Katti made it clear he would not seek a nomination to the Council as he was “not interested in backdoor entry” into legislative houses. Party insiders, meanwhile, said this was one of the ways in which the BJP wanted to reduce “the personal influence” of the Katti brothers on the district party unit. While all other leaders are loyal and obedient of the party high command, the Katti brothers are not. “This is our attempt at avoiding the buildup of a Hukkeri republic in the party unit,” a senior leader in charge of party affairs in Bombay Karnataka said.